I know this Bible verse is the true meaning of Easter and should be celebrated as such, but I still enjoy playing into the silly commercialized version of the holiday, too. I love me some holiday traditions! 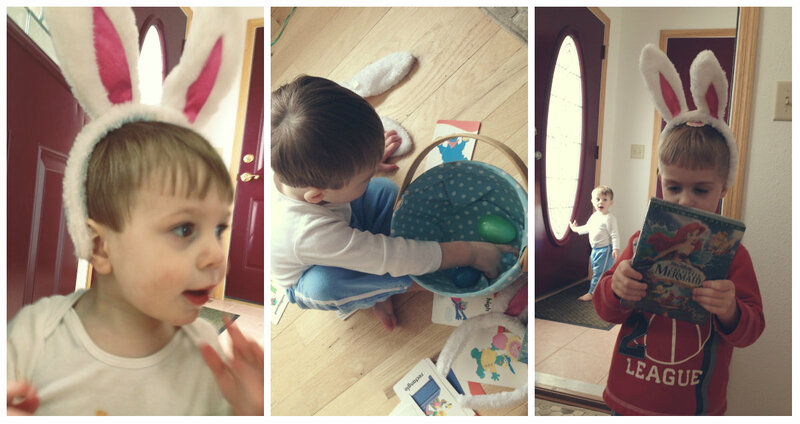 This year we began a new one that we may or may not repeat next year--an early visit from the Easter Bunny. This idea sprung Saturday afternoon when the boys and I had been battling boredom on the rainy day...and Dave, well, he hibernated in bed all day, with frequent trips to the bathroom. I knew the Bunny was planning on bringing a certain movie that could be the perfect ending to our Easter Eve. Late in the afternoon the doorbell rang, so I corralled everyone upstairs to check out the mystery visitor. Of course the elusive bunny was long gone, but he left some gifts. 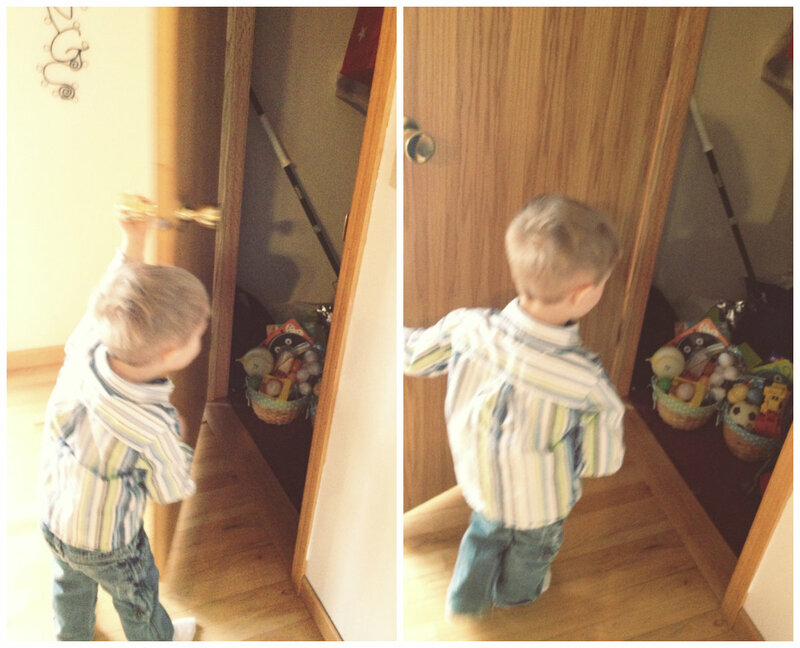 Spencer really got into the scavenger hunt this year, running from room to room to find the next clue tucked away in a plastic egg. 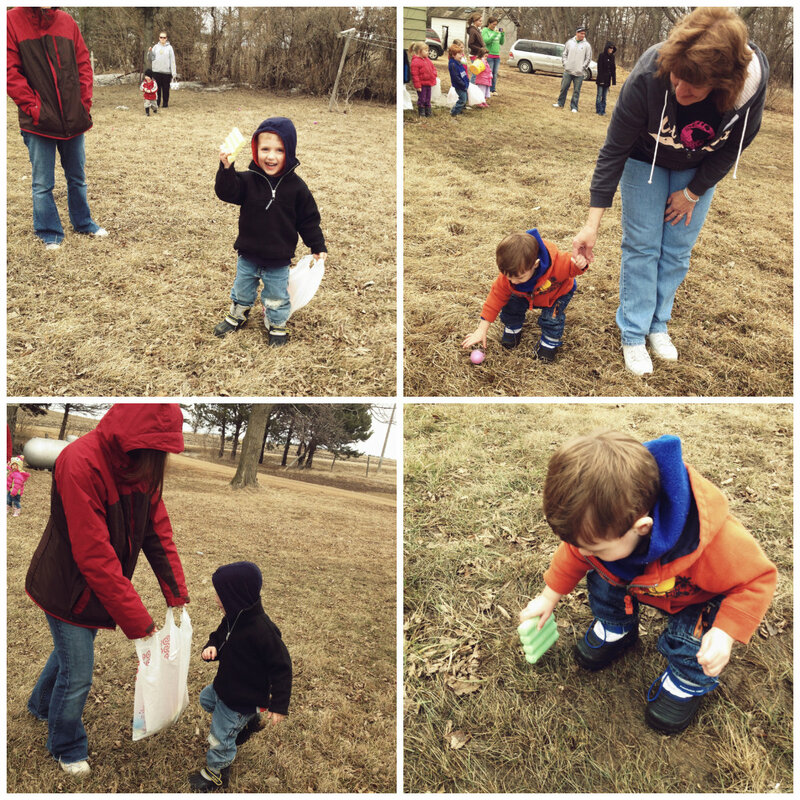 The hunt first started with a letter from the Easter Bunny. Then off we went. Clue #1: The first clue can be found with the mixing bowls. I sure am hungry for carrot cake. 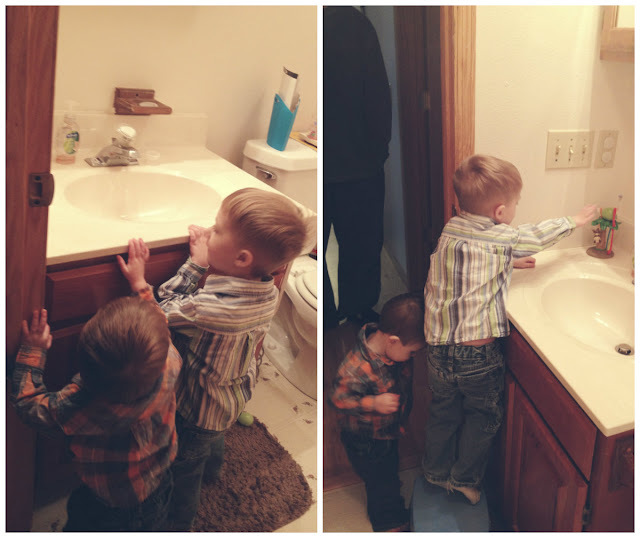 Clue #2: After eating all that cake, we should brush our teeth. Clue #3: May I take your order? I'd like Chicken McNuggets and fries. Clue #4: The game is almost done. It's time to clean up. Let's go get a broom. Every year my Aunt Velda hosts Easter at her house. She lives on a farm and the kids just love it there. Since Dave still wasn't feeling well, he stayed behind while the boys and I loaded up in the van and made the 2 1/2 hour trek there. It's always nice seeing the extended family, especially now when I have my own kids and can appreciate the role of family in our lives. Top left: Spenc showing off his loot. Top right: Aunt Velda helping Ash. Bottom left: No, that's not Cousin It; that's Aunt Hopey hiding from the cold. Brrr. Right: Ash taking a break from the fun. Middle: Aunt She-She trying to pose with her squirmy Godson. Two kings atop a hill. I love this photo...especially since it only took a million shots and a lot of coaxing for them to both look at me and smile at the same time. So I accidentally took this photo of myself while trying to take one of Ashton. I hit a button on my phone that rotates the camera. Whooops!